Maggie, inexplicably tasked with being Vanessa’s Maid of Honor, quickly discovers why everyone else refused the assignment when the Bridezilla hands her a long list of duties — the most important of which is entertaining Vanessa’s cousin, Ginger Fleer-Starke, a mysterious woman with dangerous secrets. 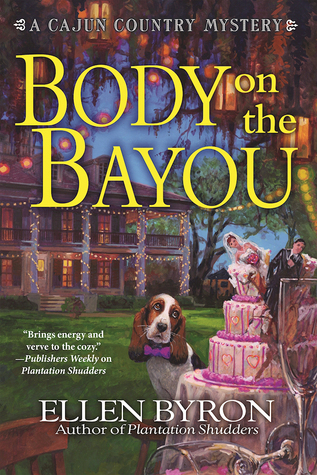 But just days before the wedding, Ginger’s lifeless body is found on the bayou behind Crozat Plantation and the Pelican PD, as well as the Crozats, have another murder mystery on their hands. As if being railroaded into playing wedding planner / mail of honor for her co-worker Vanessa isn’t enough to worry about, Maggie also gets volunteered to put the bride-to-be’s cousin up at her family’s B&B. This seems ok at first, but before long Ginger starts showing her true colors, and someone decides to do her in just days before the wedding is scheduled to take place. After finding Ginger’s dead body, Maggie adds finding a murderer to her ever-growing to-do list. The setting for the story, Pelican, LA, sounds like it would be a wonderful place to visit. The author, Ellen Byron, agrees with me of course! Here she is to tell us what’s so great about it. I’d love to visit this charming Cajun village, but that will never happen because it doesn’t exist. Pelican, Louisiana, is the fictional location where I’ve set Plantation Shudders and Body on the Bayou, the first books in my new Cajun Country Mystery series. As a mystery reader, I often gravitate toward novels that provide me with a mini vacation, albeit with murder. I love escaping to the lush countryside of Agatha Christie’s England. I’m fascinated by Louise Penny’s almost mystical Three Pines, impossible to find on a map, but located somewhere in the Quebec province of Canada. When I began my own series, I was determined to create a setting so appealing that readers would want to visit it over and over again. Of course, accomplishing this also meant creating characters that draw people in. So the residents of Pelican, like those of Three Pines, are quirky folk you’d only find in Pelican. I’ve become so attached to my protagonist, Maggie Crozat, and her friends and family that I sometimes forget they only exist on paper and in my imagination. But what’s wonderful is that Louisiana’s Cajun Country is filled with actual places and people that inspire me every time I visit. While Pelican may not exist, Breaux Bridge and St. Martinville do. And there may not be a real Crozat family, but you’ll meet friendly, unique Louisiana natives wherever you go. That’s why I’m so fond of Pelican, Louisiana. It reminds me of all the real places that are every bit as magical as their fictional counterpart. NOTE: I voluntarily read and reviewed an advance copy. Great review for “Body on the Bayou”. I can’t wait to read, love Southern plantations and the bayou, a perfect setting for a murder mystery. I haven’t been to Pelican LA, but will have to visit there next time I go to Louisana. I do like you review and description of the book.